The following text reproduced below was adapted to retell the story of Peg O’Nell, retold for Georgey on BBC Local, October 2017. Clitheroe lies south of the Forest of Bowland. It’s a pretty town in the Ribble Valley, Lancashire and close to Pendle Hill, the site which continues to capture the imagination as it’s linked with the famous 1612 witch trials. With rows of stone clad buildings and lovely hills and a petite Norman keep. This keep with its famous hole in the side attributed to a local legend that the devil, Old Nick, himself had caused it, a lucky hit from lobbing boulders he’d collected from the nearby Pennines to throw… But that, in the words of the magical storyteller Shonaleigh, is a story for another time. This evening I’m going to tell you a story that to chill you, one that causes goosebumps. And that is the tale of Peg O’Nell who is said to haunt the area around Waddow Hall. Once upon a time, a very long time ago there was an old hall located in Waddington. This is Waddow Hall, a fine manor house that overlooks the river Ribble. So the legend goes, there was a well in the grounds, just by the river. For many years, standing next to the well was a statue of a lithe young woman, a stone figurine that from a distance and at first sight seems fine but look a little closer and you’d realise that it was battered, pitted with time and wear, and headless. This is said to be the statue of Peg O’Nell, who many months, years and moons ago was a servant of the Starkie family. Imagine, the life of a servant girl! Running around after the spoiled rich inhabitants, warming the bath for the master and mistress of the house with nary a hot drop for herself. Eating any leftovers in the back rooms with the cook and other staff of the house. And the last days of Peggy were not happy ones. Peggy and the lady of the house had never seen eye to eye; the mistress thought Peggy was feckless, lazy, a good for nothing. But we have to remember that Peg was probably no more than a young teen. So, poor Peggy, scared of yet another beating, tried to quell her fear as she strapped up her badly cobbled boots and stepped outside. The wind cut through her, she panted scared clouds of condensation formed clouds in front of her eyes, fine threads of ice, like spider webs, formed in her hair. As she lumbered down the path to the river, struggling with a heavy bucket, but as she came near to the well she slipped on some icy stepping stones, tipping forward, and then landed, heavily down on her head. There was a sharp snap, as her neck broke sharply in two and her body rolled slowly down the hill, down the bank, and tumbled into the river. It was hours before a search party was sent out and there, in the water was the body of the girl, floating awkwardly on the water, the empty bucket on its side near the well. Not long after, there were a series of accidents and calamities. Any sickness or misfortunate was blamed on the residents of Waddow Hall and on Peggy’s ghost. And every seven years, there was a mysterious death in the nearby village. All of this, of course, was attributed to Peg whose restless spirit some reported seeing near the river’s edge. Of course, like any legend, this blew out of all proportion when it is said that people began to offer an animal sacrifice to appease the spirit. It’s been a little while since I’ve been in those parts, however, when I’ve walked down near the Ribble I swear I hear a voice singing, entreating me to enter its waters. But I’m sure that I’m imagining things. At least I think I am. As for the statue, well, it was still there a few years ago, still mutilated all overgrown with bindweed and moss. And as for the ghost of Peggy herself it seems at rest, but beware; if you’re near the river on Peg’s Night and it’s the turn of the seventh year then you’d best watch your back. Click the picture to go to the MCBF website. In action: Sadko is seasick! 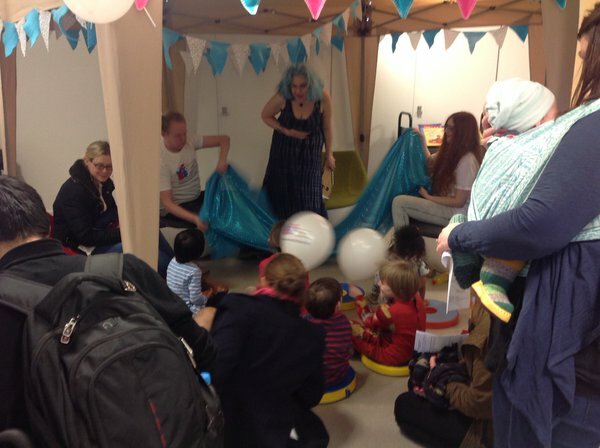 Storytelling in the cosy Manchester Children’s Book Festival Story Tent. Picture taken by Kaye Tew of MCBF. 17th April 2016. 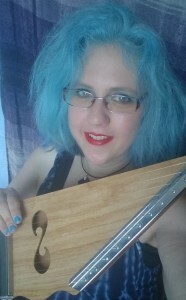 On Sunday, I told a tale based on a traditional Russian ballad of Sadko the musician and his unrequited love for Volga Matushka – the mightiest river of Russia, the longest river in Europe, one of the most beautiful of all rivers AND the daughter of the party-loving King of the Sea!Â I was so chuffed to be invited by Manchester Metropolitan University’s Manchester Children’s Book Festival Team to share this story and sing songs with the children (and their mums and dads). This event is one of many leading up to an absolutely marvellous and magical looking Children’s Book Festival for June.Â The Children’s Book Festival Fun Day on Saturday 25th June looks absolutely super! Huge thanks to James and Amy for being the river Volga and to Stu from Hobgoblin Music Manchester who fixed up Sadko’s gusli!Â There are a few versions of this story and mine was a combination of the story retold by Aaron Shepard and snippets from Baba Yaga stories (in my story – it is the Baba Yaga who curses the King of the Sea).Â The lyrics and the song I sang were based on ‘The River Flows’ by Coope, Boyes, and Simpson. The spring has sprung & events have been updated! Happy Vernal Equinox, the day where light is equal to darkness. As the spring rain tips down in Manchester, one of my beloved cats wanders in damply, she shakes her beautiful tabby fur and makes a weird gutteral mewl; she is not impressed! Although my feline friends don’t realise that, as the leaves continue to uncurl, in my more human world I’ve been plotting, planning, scheming and scribbling. Have a look at the Upcoming Events page on this website for more information. I’ll be adding more performances and workshops over the next month or so. In the meantime, here’s a picture of that cat I mentioned. 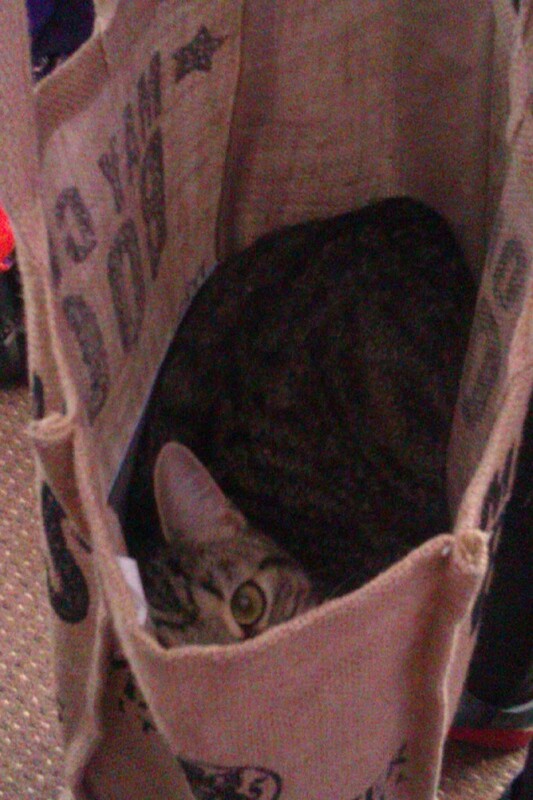 I need to nip to the shop and I think she’d like to help me! 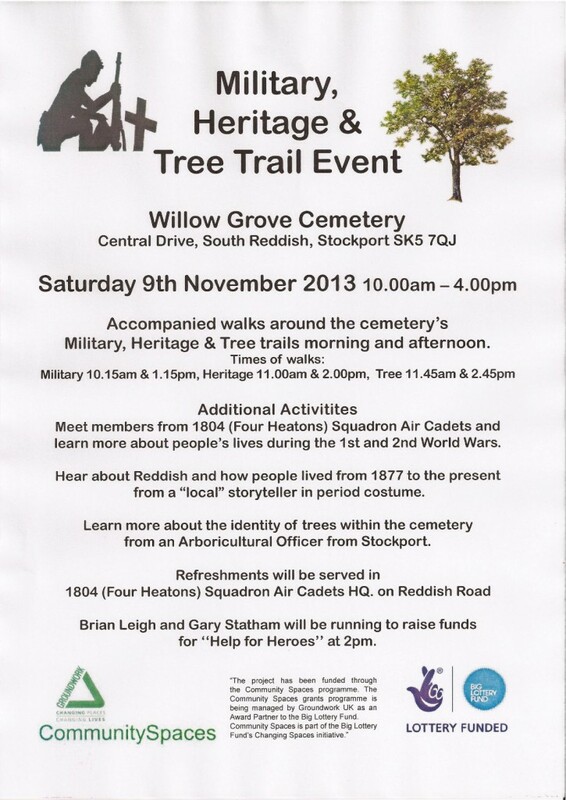 Publicity for the military, heritage and tree trail. Free walks and fun for families in Reddish, Stockport. I will be telling tales of Reddish, a small village in Stockport. I’m very excited about this; the cemetery opened in 1877 so the stories will be Victorian themed! I’ll be leading three storywalks around the cemetery. Come along and learn about the cemetery as I bring some of the cemetery’s residents back to life through retelling their stories. 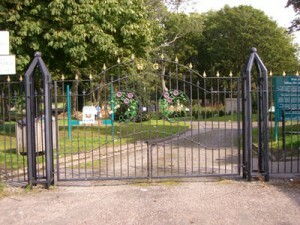 For more information on Willow Grove Cemetery, go to www.willowgrove.org.uk.